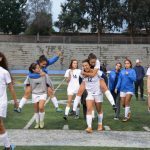 Thursday, February 16, 2017 3:00 PM Walnut High School AWAY 1 Bloomington High School HOME 2 Game Recap Walnut traveled to Bloomington High School for the first round of the CiF-SS Division 4 playoffs and the Mustangs lost a heart-breaker 2-1 on an extra time goal by the Bruins. Mustang goal scorer was Kaitlin Wong. 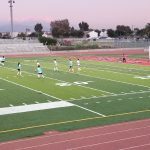 Walnut’s Girls Varsity Soccer team will face Bloomington this Thursday, February 16th at Bloomington High School at 5pm. The Bloomington Bruins finished first in the Sunkist League with an overall record of 12-2-4. Our Mustangs were in second place in the Hacienda League with an overall record of 7-10-1. 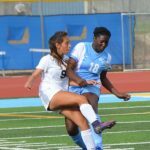 Wednesday, February 8, 2017 3:15 PM Walnut High School AWAY 6 Charter Oak High School HOME 0 Game Recap JV Girls Soccer finished up their 2016-2017 season with a 6-0 win against Charter Oak. The team had a winning record of 11-5-1, including 7-2 against Hacienda League teams.